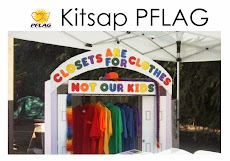 Please let Marcie know if you are interested in helping at the Kitsap PFLAG table. Seattle Pride Parade– Sunday June 29th starting at 11:00. There is always a large contingent of PFLAG folks from all over the state walking in the parade. We will post more details as we get them. The Museum and History and Industry (MOHAI) in Seattle has a special LGBT exhibit called Revealing Queer until July 6th. NOGLSTP - NOGLSTP established the Out To Innovate™ Scholarships for LGBT STEM Students, These scholarships are intended for undergraduate and graduate students pursuing degrees in science, technology, engineering, or mathematics (STEM) programs who are either lesbian, gay, bisexual, transgender (LGBT) or an active ally of the LGBT community. The scholarships are designed to promote academic excellence and increased visibility of talented LGBT students in STEM careers. Two $5000 scholarships will be awarded for the 2014-2015 academic year: one to an undergraduate student, and one to a graduate student. The deadline for applications to be received by NOGLSTP is June 7, 2014.